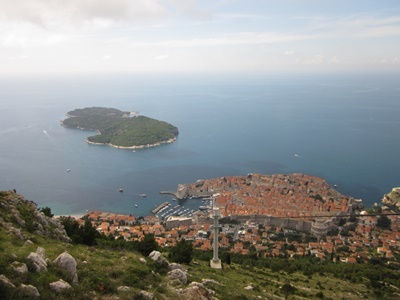 From the top of Mount Srdj above Dubrovnik you can enjoy amazing views of the whole area - Old Town, the island of Lokrum and the Elaphite islands. To reach the top of the mount you can take a cable car ride which will transfer you there in only 3 minutes. Otherwise, you can take a tour with a experienced English speaking guide which will guide you along the path to the top of Mount Srdj. Along the way you will enjoy your walk and take some amazing photos. Once you reach the top you will be amazed by the scenery. At the top there is an old military fort build during Napoleonic wars in the beginning of 19th century. Nowadays it is used as a Museum of Croatian War for Independence. There is also a restaurant and coffee bar where you can refresh yourself before you continue your trip. The hike continues with a descent down the north-west side of mount which gives you a beautiful view to the port of Gruz and the Elaphite islands. The path is well marked but rocky, so a pair of good trainers or hiking shoes are necessary for this hiking trip. The whole hike is 9 kilometres long. Besides a rich history of Dubrovnik's Old Town there is a beautiful nature that surrounds the city. One of the most popular destinations among locals and tourists are the Elaphite islands to the north-western of Dubrovnik. The island of Kolocep with its rich Mediterranean forests and walking paths is ideal for hiking. Take a tour on which your guide will show you the best hiking paths. Along the way you will have swimming and cliff diving stops to enjoy during hot summer days. This tour departs from the port of Gruz from where you and your group take a local ferry to Kolocep. Be sure to bring with you comfortable walking shoes, water, hat, sun glasses and sun block cream. Your tour guide can arrange a lunch in a small local fish restaurant or you can bring a picnic lunch with you.